It's time for another derby (Sunday 4.15pm CET). And if the recent meetings in the Copa del Rey are anything to go by, then this is not a game you will want to miss! This Sunday (4.15pm CET), FC Barcelona make the short trip up the road to Cornellà to the only place where they have lost a game in the league or cup this season. Yes, it's time for another visit to local rivals Espanyol. Ousmane Dembélé and Thomas Vermaelen are still injured for FCB, and although Andre Gomes is over his illness, he was also left out of the squad announced on Saturday. Colombian Carlos Sánchez, better known as ‘La Roca’ (the rock), has been included in the Espanyol squad just a few days after being loaned from Aston Villa via Fiorentina. Dídac Vilà and Pablo Piatti both miss the game through injury. Among other topics at his pre-match press conference, Ernesto Valverde discussed the importance of matching the intensity that Espanyol always put into derby matches, the possibility of resting Andrés Iniesta and the dangers of thinking that his team can afford to relax in La Liga. For Barça, a win or a draw would set a new club record of going 22 games into a league season without defeat. Already eleven points clear at the top of the table, Barça's lead could get even bigger this weekend as second placed Atlético host third placed Valencia (Sunday 8.45pm CET). After back-to-back losses to Sevilla and Leganés, Espanyol are down to15th, although there’s a seven-point gap between them and the relegation zone. The oldest surviving fixture in Spanish football has generally been lop-sided in favour of the blaugrana, who have only ever finished below Espanyol in the league on three occasions – for the last time way back in 1939-40. And they may have won last month’s Copa del Rey first leg, but the parakeets are still looking for their first Liga win over their neighbours since moving to their new ground in 2009. 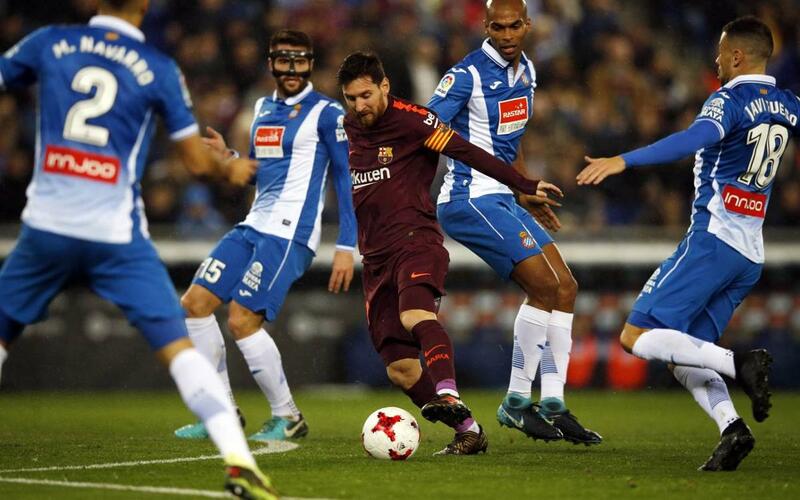 In fact, Barça haven’t even conceded a goal on their last five league visits to the RCDE Stadium. The derby is essential TV viewing for any self-respecting fan. But if you are unable to see it for whatever reason, then why not treat yourself to our live English language commentary on Radio Barça? The link will appear on our home page shortly before kick-off. Oh, and don’t forget that you will find live updates on all the action in our Twitter account. Força Barça!